Panasonic, the manufacturer, has discontinued this spare, we’ve retained this page for information purposes and to help you find alternative replacement parts, spares & accessories. 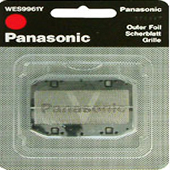 Replacement foil unit for Panasonic Models: ES301, ES804, ES865, ES867. I'm from South Africa and need order no,PAN 1000 for a ES 804 wet dry men's shaver. I want to buy it for my dad whoes outer shade brakes. What must I do do buy from you.